Regulatory issues continue to plague some of the bank's operations, CEO Thiam says. Credit Suisse Group AG will shrink parts of its investment bank and focus on growth in Asia and wealth management, Chief Executive Officer Tidjane Thiam said. The shares surged the most since he landed the job four months ago. “We’re dealing with a really very well-performing investment bank, but where sometimes regulation has developed in an unsupportive or unfavorable way,” Thiam, who took over in July, told analysts on a conference call Thursday after the bank published earnings. Thiam, 52, formerly the CEO of insurer Prudential Plc, said Switzerland’s second-biggest bank will allocate more capital to wealth management and seek to grow in Asia and developed markets such as its home country. Scaling back the investment bank in favor of managing money for rich clients would mirror the approach of UBS Group AG, the bank’s larger Swiss rival. The bank recorded a net income of 1.05 billion francs ($1.1 billion) in the second quarter. That was above analyst estimates and compares with a loss of 700 million francs a year earlier when bank was fined in the U.S. for helping Americans evade taxes. Credit Suisse shares jumped as much as 7.8 percenton Thurday, the biggest intraday gain since Thiam’s appointment was announced in March. Shares were trading up 6.2 percent at 28.51 francs at 5:43 p.m. in Zurich. The Swiss bank is already the third-biggest private bank in Asia after Citigroup Inc. and UBS, according to a ranking by Asian Private Banker. Credit Suisse says it has expanded lending to very rich people in the region by 2.8 billion francs since the start of the year. The region’s potential is so great that the bank doesn’t have to overtake competitors, it just has to keep growing, said Alevizos Alevizakos, a London-based analyst at Keefe Bruyette & Woods. As global regulators order lenders to hold more capital to absorb potential losses, the fixed-income trading departments of their investment banks are among the most affected. Revenue from debt trading fell 13 percent to 1.24 billion francs from a year before. The private banking and wealth management unit posted a pretax profit of 1 billion francs, beating analyst estimates. Investment banking, by contrast, reported 615 million francs, a drop of 18 percent and below analyst estimates. Credit Suisse’s common equity Tier 1 ratio, a key measure of financial strength, was 10.3 percent at the end of June, the lowest along with Bank of America Corp. among the seven leading investment banks that have reported data for the second quarter, figures compiled by Bloomberg Intelligence show. 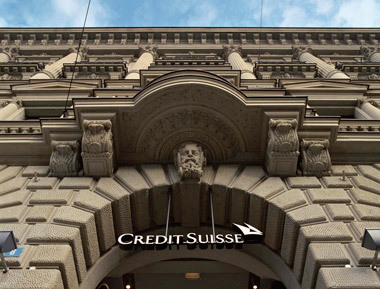 Thiam said it’s not clear whether the bank will need to raise more equity, adding that Credit Suisse will concentrate on businesses, such as wealth management, that operate “comfortably” above their cost of capital. He plans to present his new strategy later this year.